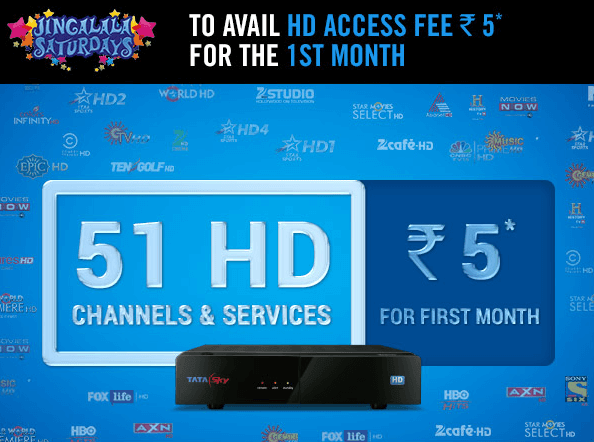 TataSky the leading DTH operator which currently provides 49 HD channels and services (Highest in the industry at present) has launched a special promotional offer for its subscribers who have an HD set top box but are still subscribed to only SD packs. The offer which is only valid up to midnight today gives the subscribers a promotional rate of only Rs.5 for HD access fee for the first month and there after it is charged as Rs.175 from the next month onwards. TataSky includes HD channels from the level of base packs itself but to view those HD channels the subscriber needs to pay an HD access fee which until recently was Rs.125 after which TataSky hiked the fee to Rs.175. This is a good initiative by the operator to give the subscribers a chance to experience the picture clarity and sound quality of true HD channels so that they would continue with it and lead to an increase in the ARPU of the operator. TataSky has also removed Star World Premier HD channel from the specials list and integrated it into the english entertainment section. Initially subscribers needed to pay Rs.60 a month to watch that single channel which was not even ad free unlike HBO Hits and HBO Defined and offered the only advantage of airing shows along with its USA premier timing which Zee Cafe HD also does without charging a premium.